We all read pictures…why am I one of the only ones that sees it? Please keep up with all of my old Graphic Novel Reviews here as I quest for 365 in 365 days! I took a trip into the city today with a couple of old students to grab lunch and hit up a couple of stores, possibly to find some new books for a Graphic Novel Review or two. I wanted to hit up Quimby’s Books in Wicker Park at 1854 W. North Ave. in Chicago, of course. I love Quimby’s! They have some of the most unique product. Their collection of independent comics and zines are almost unparalleled. You might disagree with me, you might have YOUR SPOT, but for me, Quimby’s is A-1. Above is what I ended up picking up at Quimby’s. They have an amazing collection of comics and graphic novels, so whenever I go in there it’s rough to select only a few. Pretty much everything is cover price, unless you consign a title with them. If you do, you get 10%. It’s great to go in and explore the litany of interesting books, but it’s hard not to take note and check the price on Amazon. I always end up spending a few bucks even if I can find the title cheaper on Amazon. I know how hard it is for brick and mortar shops, so I support them when I can. With that said, there are tons of things at Quimby’s that you can’t find at a massive on-line shopping site like Amazon. And it’s for these titles that Quimby’s is essential to the industry voice. I did pick up a couple of obscure books from bigger publishers, but I also picked up a few small-press books. 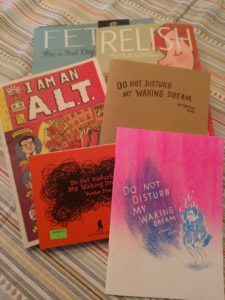 I got three issues of Do Not Disturb My Waking Dream by Laura Park. It’s an autobiographical mini-comic that is broken up into short segments about Laura’s life. The art, while simple and black & white, does utilize some amazing cross hatching, and many of the short tales are interesting. The small booklets are available through Uncivilized Books, and you can check out their catalog here. I dig the books. I love the honesty and vulnerability of Laura Park. And I must say, as I perused the collection at Quimby’s, the honesty and vulnerability practically falls from the shelves in that store. I think I even saw actual physically drawn mini-comics on the shelf. The power of “Here’s my art! Love it or hate it!” is very present at stores like Quimby’s. And it’s a great place for teachers to check out titles that might not cross their “Other items shoppers have bought” list. Israel Martin Diaz Suarez on Sunday’s For Teachers: De-stress, Peeps! Don on Sunday’s For Teachers: Should We Have Political Opinions?